In this review we take a look at the Top 5 gun vises on the market. A professional gun vise and maintenance center is a big improvement over the bench vise. A bench vise is not the ideal method of securing your firearm while cleaning it, due to the sharp edges which can scratch sensitive areas of your gun. Most gun vises come with padding and soft corners to prevent scratching your firearms. The gun vise is designed for basic gunsmithing and cleaning your long guns. In this review, we looked at all of the most popular gun vises on the market and even the not so popular ones. You want a gun vise that will easily lock your rifle into place for cleaning and isn’t made of flimsy plastic. Keep in mind that a gun vise is not shooting rest and should not be used to hold your gun for firing. The ideal use of the gun vise is securing your rifle for cleaning and installing scopes. 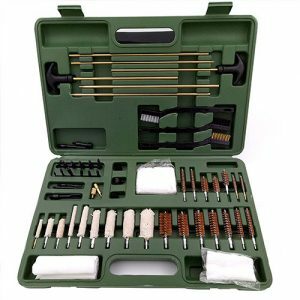 The built-in maintenance centers on many gun vises allow you to easily keep track of all your tools, gun parts, and cleaning supplies. Sometimes there’s a product that comes out that’s so much better than what you’ve used in the past and you get excited. This is one of them! We bought the CTK gun vise last year and it replaced my old Tipton and I’ve never been happier. Most people like to do things a certain way and turn it into a habit. But once in a while something new comes a long and it’s time to change those old habits. 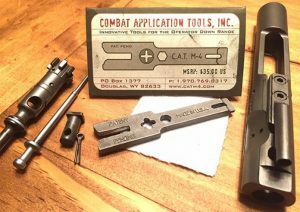 What I like most about the CTK is that it’s SOLID as a rock and won’t budge an inch. Also include now is P3 Ultimate Gun Vise add-on which used to be sold separately but now comes with it. The top image displays what the CTK looks like without the vise attachment and this allows you to use it as a shooting rest. When you attach the vise it will clamp to the 1″ square tubing on the vise. It has a huge crank handle that allows you to tighten the vise. The padding is also great and very soft and you won’t damage your gun. This gun vise is the Amazon’s choice and has by far the most positive reviews of all other gun vises. I certainly couldn’t think of anything to complain about, so I took a look online to see what others were saying. The biggest complaint was about the assembly instructions. You can go on YouTube and CTK makes a bunch of high quality videos to help you get this bad boy assembled in no time. Other than that, the price is fair, the entire vise is the highest quality and I absolutely love mine! Hyskore makes some of the best gun cleaning vises and shooting rests on the market. The majority of their products are shooting rests but this gun vise that they’ve come out with has it all. Made of some very high quality materials, the Hyskore Is about 90%, unlike may of the other cheaper plastic gun vises. Many of the other big name brands sell a gun cleaning vise that is equal in quality to this one or worse and charge more money, due to the name of their brand. Once assembled, this gun vise will lock your gun in place and it’s not going anywhere. There aren’t any cheap plastic parts on this vise that will cause your gun to come loose. One the package it does say, “NOT A SHOOTING VICE!”. If you try to shoot your firearm while it’s clamped down, you will most likely damage either your gun or your gun cleaning vise, or both. The built-in cleaning parts try has seven slots, which are molded to fit gun cleaning solvents and brushes. There’s also a nice slot on the side for holding your cleaning rods. Also, there is a built-in level, which comes in very handy if you’re mounting a scope. The pictures don’t do this gun cleaning vise justice. I have used it in person and a good friend uses this and told me it’s easily the best gun vise on the market, and he’s used them all. The only thing that could be improved is the plastic cleaning parts try in the center. It’s made of thin plastic and it should have been made of metal. Overall, nothing but good hings could be said about the gun vise, the only thing that needs improving upon is the plastic parts keeper. The MTM Gun vise and gun cleaning station shows how to make a reliable and inexpensive gun vise. 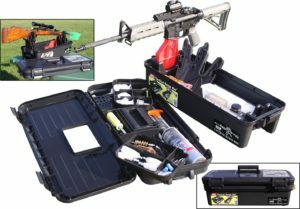 Designed for all rifles and shotguns, this gun vise is made of high quality plastic and includes a cleaning parts tray with 11 compartments and 21 brush holders molded into the unit. The plastic is polypropylene which is a very high strength reinforced plastic compound and is very rugged. There are better gun vises out there if you want to spend more money but for this price range you’re not going to find a better gun vise. 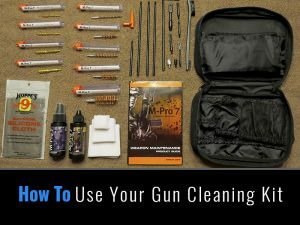 It does an excellent job of holding your firearm in place, in order to easily use your cleaning rod. 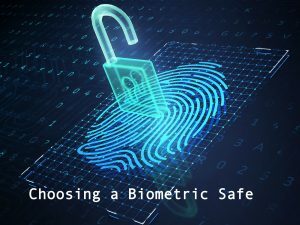 Many people are surprised by how well it secures their firearms. You won’t be able to budge it an inch. Also, the gun cleaning station is really nice and has everything you need for holding from your gun cleaning kit. Adjustable clamps to securely hold down your firearms. Overall, this is a very high rated gun vise and one of the best out there for the price. It doesn’t come with instructions, so you will have to go to YouTube and watch them use this is action. There are some great videos and tutorials on how to use this gun vise. The hold is not as good as some of the other gun vises but it will tighten to any long gun you have and no complaints about breaking or anything like that were reported. Possibly the best plastic gun vise on the market, the Lyman is easy to use and easily adjusts much quicker than other gun vises. It rotates and adjusts for you to easily use it for any firearms, including all kinds of pistols. Many of the other gun vises out there don’t adjust small enough to clean a pistol, this one does. Like all other gun vises, this isn’t mean to be a shooting rest. It’s made of high quality plastic with metal sliders that allow you to adjust it to any length. It’s lighter than most other gun vises, weighing in at under ten pounds. The real reason we like this gun vise over many of the others is because it’s about half the price. You can perform all your gunsmithing and cleaning and the padded fittings hold your gun very securely. Easily rotates to clean the bottom of your guns. If you’re on a budget than this is the best gun vise you’re going to find. It has a simple yet effective design. It’s made of plastic and many people seem to prefer metal. The plastic is high quality and there haven’t been any complaints about the plastic breaking or bending. Overall, nothing very negative was said about this gun vise. It does the job and at a great price. When people search for the best gun vise they often see Tipton. This is because the name of this gun vise is ‘Best Vise’ does this mean it’s the best gun vise out there? In this review we’ll take a closer look at the vise and get a little feedback from some people who have actually used this vise and compared it with others. To start out, the Tipton is not at the top of the list because we feel that it’s not really the best gun vise out there. Or should we say, the highest quality gun vise. 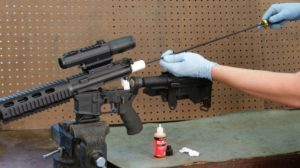 Sure, Tipton has a great reputation for cleaning products, mainly their carbon fiber cleaning rods, but that doesn’t mean they are experts in making gun cleaning vises. It seems to be a bit overpriced for the job that it does. It’s the most expensive gun vise on the list but doesn’t really compare to a few of the others on this list. The entire unit is made of plastic but don’t get me wrong it’s very versatile. You can fit just about any firearm in it and they’re easy to mount and it holds them steady. It only takes about 10 minutes or so to assemble and it’s pretty easy. One of the problems a lot of people have is the vise. Since the unit is so light it doesn’t really to the best job of holding and does flex from time to time. Many complaints have been made of the light weight and flimsiness of this gun vise. 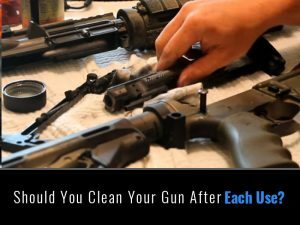 It’s not as sturdy as you need it to be if you’re going to be doing some really hard cleaning on your firearms. It’s made from cheaper plastic than some of the other gun vises and I’m kind of surprised by all of the negative feedback about it online. One other thing is that the price is always changing. One day it will be $130 and the next day it might be $65. So if you want to give this one a try, watch the price for a few days before buying.